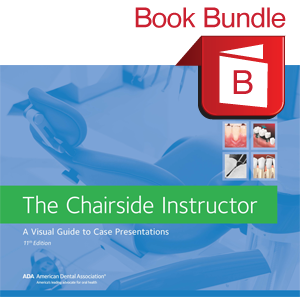 With over 250 full-color photos and illustrations (including 51 new/revised in this edition), the Chairside Instructor covers a wide range of prevention and treatment topics, including hygiene; anatomy; x-rays; perio; tooth restoration and replacement options; cosmetic treatment; TMD; pathologies; bruxism and more. Book has 58 laminated pages, 11” x 8.5”. The e-Book can be viewed from any device with web-browsing capabilities. A link will be provided in your Order Confirmation email. Your can also access your e-Bookshelf from your My ADA page (go to My Account/ My Downloads). For e-Book details, visit the e-Books FAQ page. This e-Book page also includes a downloadable PDF of The Chairside Instructor.